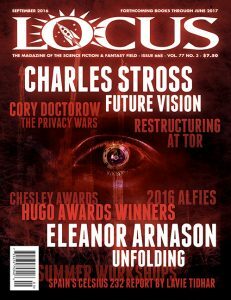 Notes on milestones, awards, books sold, etc., with news this issue about Philip Pullman, James Gunn, Michael Crichton, Frank Herbert, Catherine Asaro, Janny Wurts, Tamora Pierce, Roger Zelazny, and many others. 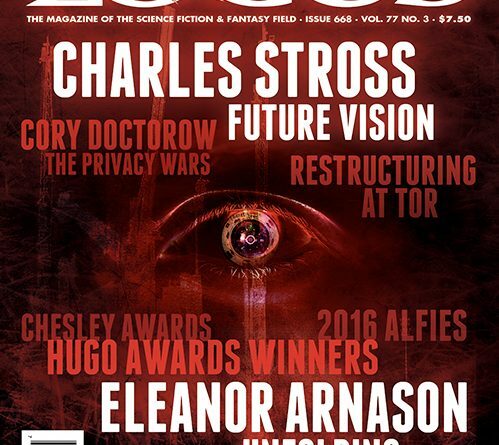 F&SF 7-8/16; Asimov’s 9/16; Clarkesworld 6/16, 7/16; Lightspeed 8/16; Beneath Ceaseless Skies 7/21/16; Lady Churchill’s Rosebud Wristlet 7/16; Swords v. Cthulhu, Jesse Bullington & Molly Tanzer, eds. The Gradual, Christopher Priest; Everfair, Nisi Shawl; Summerlong, Peter S. Beagle; The Best Science Fiction & Fantasy of the Year, Volume Ten, Jonathan Strahan, ed. Breath of Earth, Beth Cato; Eterna and Omega, Leanne Renee Hieber; Arabella of Mars, David D. Levine; The Obelisk Gate, N.K. Jemisin; SHORT TAKES: Poison City, Paul Crilley; Red Right Hand, Levi Black; Nightshades, Melissa F. Olson. Disappearance at Devil’s Rock, Paul Tremblay; The Vegetarian, Han Kang; Singing with All My Skin and Bone, Sunny Moraine; Dreams from the Witch House: Female Voices of Lovecraftian Horror, Lynne Jamneck, ed. Summerlong, Peter S. Beagle; Making Conversation, Teresa Nielsen Hayden; A Fierce and Subtle Poison, Samantha Mabry; Cloudbound, Fran Wilde.